When I discovered that black bean brownies were a thing that existed in our universe, I was instantly intrigued. The black beans actually replace the flour called for in the brownie. I’m not even going to begin to try to understand how that whole situation works because chemistry seems hard. But I’m all for making things healthier so I spent a good chunk of my Thursday afternoon searching the internets for “the best black bean brownie recipe” and do you know what I found? The same recipe over and over with a slight variation here and there. With so many people using this recipe and proclaiming it to be “delicious” over and over I figured that it must be a winner. It most definitely was not. I’m not even going to post it here. If you’re really curious, do a quick search and you should easily be able to find that recipe and be well on your way to a pan of chocolate flavored pureed black beans. Check out the fats section. See where it says you can substitute butter with avocados? I used a really simple brownie recipe that I love because it uses cocoa powder instead of melted chocolate. It’s great in a pinch, there’s no melting of anything involved, and it’s so easy my kids can make it. I pulled a switcharoo on the sugar as well, trying to get away from the refined white sugar called for in the recipe. My kids ate every bite of their brownies and then asked for seconds. And they ate them the second day too. I was able to detect a slight avocado after taste but I’m also one of those super-taster people who can’t stand bitter things that other people can’t even taste and I can tell when there’s coconut oil or food coloring in something without ever reading the ingredients so don’t go by my highfalutin’ opinion. If you’re really craving a brownie, go for the version made with butter and sugar because nothing beats that. But… oh I don’t know, maybe you have some extra avocados lying around, or maybe you want something a little healthier, or maybe you want to try something a little different, or maybe you just want to mess with your kids by sneaking produce into their dessert, I won’t pretend to know your life. Add the first five ingredients to a large bowl and whisk well to combine. Make sure there are no avocado lumps. The mixture should be smooth. Add the remaining dry ingredients and whisk until combined. Pour into a greased 9 inch pan and bake at 350 for 20-25 until done. Whisk together until smooth and shiny. If it’s too thin, add a tablespoon or two of powdered sugar, if it seems too dry, add a tablespoon or two of milk. Spread on top of the brownies once they’ve cooled and add sprinkles if you want ’em. On any given day, if you search the internet for a “green smoothie”, you will undoubtedly find endless variations of just that, green smoothies. You can add spinach to pretty much any smoothie that contains berries and/or pineapple and as long as you blend it long enough, you will not taste it. There are no recipes to follow and you don’t need to get any measuring cups out. Just get a handful of fresh or frozen spinach and throw it in. Spinach in smoothies is all well and good but what I really want to tell you about is how to take it a step further and add kale. Kale is good for you. Super good. Isn’t it large and informative? I drink this smoothie several times per week. I just feel better when I do and I can also see a noticeable improvement in my skin and energy level. It’s also husband and super picky teenager approved because it tastes like peanut butter and banana – not greens. If that means anything to you. I used to use fresh kale and just cut the leaves off of the stem. But I recently discovered bagged organic kale at my grocery store for less than $4, so that goes into my cart every week and then right into the freezer when I get home. For this smoothie you can use fresh or frozen greens. You’ll notice that there are no measurements when it comes to the greens so it’s customizable to your taste. Add as much or as little as you like. I put two good handfuls of kale and about half a bag of spinach in my smoothie. If it’s too thick, I add a little more almond milk. It’s a smoothie. It should be simple. Just toss all that goodness into your blender and let it whirl for at least a couple of minutes. That gives everything enough time to get thoroughly chopped and blended. Makes for a much tastier smoothie. If you want more peanut butter flavor, add more peanut butter. Want a thicker smoothie? Add more banana or yogurt. Too thick? Add a little more milk. Now that you’re putting kale in your smoothies, why not take it a step further and put it in rice, couscous, pasta, meatballs, sauces, soups, and mashed potatoes! Chop it up, saute it in extra virgin olive oil with garlic and a little sea salt until tender and mix it into mashed potatoes. Then top a shepard’s pie with it! I’ve done it – you should too! * Makes 1 large or two regular sized smoothies. These are the granola bars that I give to my kids. They don’t come individually wrapped in a box. There’s nothing hydrogenated, high fructose, or artificially flavored about them. They’re just little bars of oats, nut butter, honey, a little sugar, and whatever seeds and dried fruit I happen to have in my pantry thrown in for good measure. They got their name from Camryn (naturally). She couldn’t say granola when she was little and “gralowly” was about as close as she could get. Over the years, the cuteness factor caused the name to stick. Gralowly bars are a bit different from regular granola bars in that they don’t have any puffed rice or sweetened coconut that so many other granola bars have but if you like those things you can certainly throw them in as well. These bars are dense yet chewy and surprisingly filling. Making them is easy, there is no baking required, and you can pretty much put anything you want in them. And because they don’t require refrigeration, they’re great to wrap individually in wax paper or small baggies and throw in your purse for a quick snack when you’re out with your kiddos. They won’t keep your little ones from screaming their faces off for happy meals but at least you’ll feel better about offering them a healthier option. In the microwave: Put honey, PB, and brown sugar in a microwave safe bowl & microwave on high for two minutes. Stir halfway through and again at the end of the second minute. On the stove top: Add all three ingredients to a sauce pan and stir over medium heat until combined. You shouldn’t feel any sugar granules when you stir. Take off the heat and add the vanilla, cinnamon and sea salt. In a large bowl add all of the other ingredients. Seriously, just throw all that other stuff in and stir to incorporate everything. Pour the liquid mixture over the rest of the ingredients and stir to combine. Dump mixture into a lightly greased 8×8 pan and pack it down to make everything even. Let the mixture cool completely before turning out and cutting into bars. Store at room temp in an air tight container for about a week. * If you prefer puffed rice cereal in your granola bars, reduce the amount of quick-cooking oats to 2 cups and add 2 cups of puffed rice cereal. * For a cheaper/vegan friendly option, feel free to substitute honey with corn syrup. The consistency is similar so it should work just fine. Is it hot at your house too? It was 90 degrees here today and it’s only going to get hotter. Come snack time, cool treats beat out everything else. So I whipped these frozen fruit and yogurt bites up in just a few minutes for my kids to snack on this afternoon. They don’t take long at all to freeze either which is a good thing because my kids are not patient people. As I was eating them I couldn’t help but think that they would be great on top of a salad. Somebody try that and let me know. Anyway, to make these for your kids (or yourself) just wash and dry some fresh fruit, then coat in yogurt, add toppings, and freeze on a large plate or sheet pan covered with wax paper until hard. I added wheat germ, chia seeds, hemp seeds, and a few sliced almonds here and there to the tops of our fruit. If you’re using a thinner yogurt, you may want to dip them a second time once they’ve firmed up a bit in the freezer so you get a nice thick layer of yogurt. Add your toppings after the second dip. I used cherries (which had been pitted and cut in half) and red grapes but you could use any fruit you prefer. Obviously the toppings are up to you as well. Chopped pistachios and chocolate drizzle over cherries? It’s very very rare that I get a recipe just right on the first try. This was an unusual exception. I’m not talking about following an already established recipe. That, I can do. What I’m gettin’ at here is coming up with an original recipe because as far as I know, none exist. Normally the process takes time and numerous do-overs and eventually destroys my kitchen, my patience, and my ego before it’s all over. But this time everything just worked. They’re called flapjacks and they’re fabulous! They’re also very small and you only get three, which is fine if your daughter doesn’t steal them all from you and shove them in her face like a chipmunk gathering nuts for the winter. 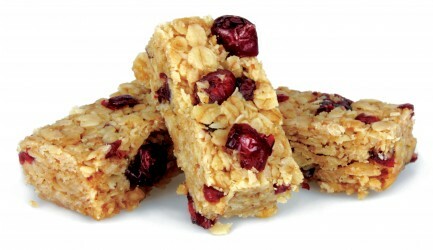 Flapjacks are lightly sweetened oat bars with dried fruit and a little spice. They’re somewhere between a chewy granola bar and a soft oatmeal cookie. I ♥ them. So does my kid. So naturally I knew that I needed to figure out how to make them myself just in case there is ever a flapjacks shortage some day or Graze discontinues them. Since flapjacks aren’t technically granola bars, my usual granola bar recipe wouldn’t work here. And since they’re not technically oatmeal cookies, my oatmeal cookie recipe wouldn’t work either. So I checked the ingredients for all of the different flapjacks on the Graze website and did my best to recreate them. The end result was pretty darn close. If you’re a fan of flapjacks, I really think you’ll like these. I also added these to my bars but you could use any dried fruit you prefer. Sweetened coconut, nuts, chia seeds, hemp seeds, toffee chips, and mini-chocolate chips would be yummy as well. Add the butter, honey or golden syrup, and brown sugar to a sauce pan and stir over medium-low heat until the mixture begins to bubble. Stir the mixture slowly as it bubbles for 2-3 minutes and then take it off the heat. You don’t need to time it, you’re just looking for everything to become well incorporated. You shouldn’t feel any sugar granules when you stir. Remove the pan from the heat and add the vanilla, cinnamon, allspice, and salt. Whisk to combine. In a large bowl, add the oats and any additional items you might want in your bars. Add the caramel mixture to the oats and stir until the mixture comes together and everything is well incorporated. Lightly spray an 8×8 pan with non-stick spray, or line with plastic wrap or parchment paper. Dump the mixture into the pan and press it with your fingers to even it out. If things start to get too sticky, just dampen your hands a bit. Allow the bars to cool completely before slicing. *Updated 9/5/15: After making these bars several times since the recipe was originally posted, I’ve been able to make a few changes that actually make this recipe much faster and easier than it was before. I’ve listed a few additional alterations below. I hope you like this new and improved flapjack recipe as much as the original. Rolled oats can be used instead of quick-cooking oats. Just give them a pulse or two in the food processor or blender first. I sometimes toast my oats before adding them to the caramel mixture by spreading them onto a dry sheet pan and sliding them into a preheated 350° oven for 1-2 minutes. For crispier bars: Press the mixture into an 8×8 pan and bake in a preheated 350° oven for about 10 minutes. I’ve actually gotten sidetracked and left them in the oven for up to 15 minutes and they were fine. Allow to cool completely before slicing into bars. * Graze is a weekly snack subscription service. I was asked recently by FunBites if I would be willing to review one of their cutters. I’m pretty sure that I was the only blogger left in lunch land that didn’t already have one of these. So I think you know what my answer was. FunBites come in two styles: Cube It! which makes 12 square bite-sized pieces, and Luv It! which makes a geometric heart pattern and two smaller hearts. I chose the Cube It! FunBites cutters can be used on sandwiches, fruit, veggies, pizza, burgers, tofu, omelets, cheese, pancakes, pretty much anything. Seriously, these cutters are tough! I wanted to do something a bit different with my FunBites Cutter so I used mine to make bite-sized butter cookies. The type of cookie really doesn’t matter here, just make sure your dough is nice and cold. I like to roll mine out between two sheets of wax paper, so it doesn’t stick, lay it on a sheet pan, and then pop it into the freezer for 20-30 minutes. If your dough has chilled enough, you should get nice clean edges just like that up there. However, if your dough sat out for a bit due to… oh, I don’t know, kids who are on spring break and “need you” every two minutes – your dough might not come out so square. If that happens, just tap the edges down lightly with your finger. Easy peasy. Cookies this size don’t need long to bake. Mine took between 5-7 minutes. Then I got to thinking about other things I could do with the FunBites Cube It! I had a can of cinnamon rolls in the fridge – perfect! I rolled each of them out just a little and then used the Cube It! to cut little squares. These little cinnamon squares were a big hit with both of my kids. You can serve them with the glaze on the side for dipping as I did below or toss them with the glaze and let them set before you serve them. I just made a grilled cheese sandwich, let it cool for a few minutes so the cheese could set a bit, then cut it with my FunBites Cube It! I plopped a few on top of some veggie soup and it was lunch. If you like your grilled cheese to stay more crisp, just serve them alongside the soup rather than in it. Or serve it on a skewer with some lunch meat and/or a tomato in between for dipping, Yum. If you’re buying croutons you need to stop it! It’s way too easy (not to mention cheaper) to make them yourself. They taste better too. I use whatever bread we have lying around, this is actually whole wheat sandwich bread. I cut the bread with my Cube It! then I tossed it in a bit of extra virgin olive oil, sea salt, garlic powder, and Italian seasoning. Then I toasted it on a sheet pan in a 300 degree oven for a few minutes until toasty. After using the FunBites Cube It! for a couple of days, I can see where you could literally use it for every meal. I used it for breakfast, lunch, snack, and even a sweet treat but you could also use it to make bite-sized appetizers or to cut food into a safer size for little ones. If you want to learn more about FunBites, or if you want one for yourself, you can visit their website: www.funbites.com. Enter my giveaway and win one! 3rd: Tell me in the comments section below which FunBites cutter you would choose if you won, Cube It! or Luv It! You must complete all 3 steps to win! The winner will be selected by Random.org on April 4th, at noon and notified by email. Winner has 48 hours to respond. If I don’t receive a response from the original winner within 48 hours, I will choose another winner via Random.org. This FunBites giveaway is open to all residents of the US & Canada. Disclosure: I received a FunBites Cube It! cutter to review. No other compensation was provided by FunBites. All photos are the property of WSBFL and opinions given in this review are solely my own. * This giveaway is now closed.